So, I've been rocking this chunky twisted bun all week. I looove it! So much so I am considering going for it It's made this week with my hair so easy. Tie it up with my silk scarf at night, take it off and go in the morning. It was also easy to moisturize and refresh throughout the week. Best of all, it was really easy to do! Let's get to the details of that, shall we? I decided I didn't want to do my hair this week so I turned to YouTube for some inspiration. The first video I found, which I'll include at the bottom of this post, seemed quick and cute so I went for it. I divided my hair into 6 uneven sections, 3 in the back & 3 in the front. 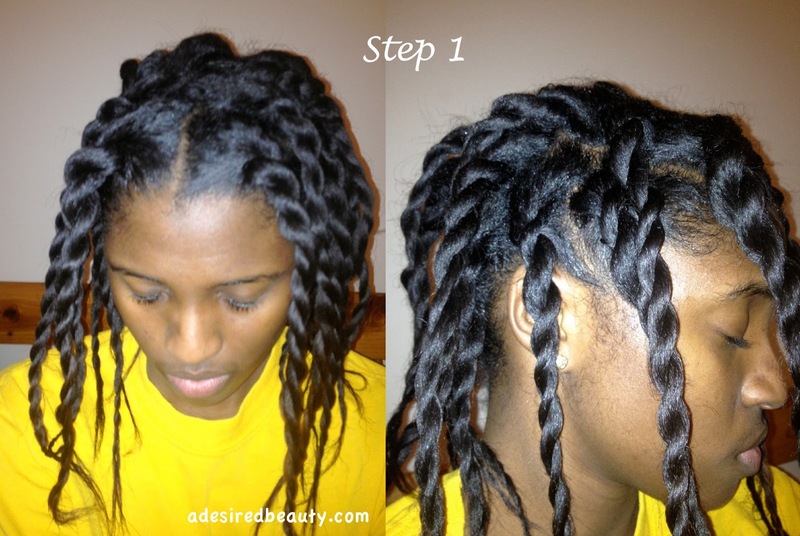 Then started two-strand twisting section by section. 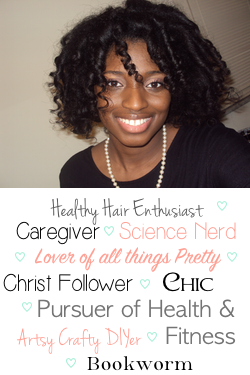 I used the Shea Moisture products I've raved about in previous posts: Curl Enhancing Smoothie and Curling Souffle. 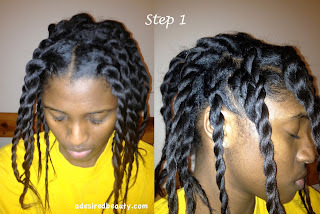 I didn't part my hair within the sections to create the twists, I just grabbed enough hair for a medium sized twist and twisted until I got about an inch or so away from the end, finishing with a braid to ensure the twist would stay. After my whole head was twisted up, I pulled it all up into a ponytail at the top of my head. Here's where I kinda put my own spin on it. In the video, she uses braiding hair to create twists for her fly bun. 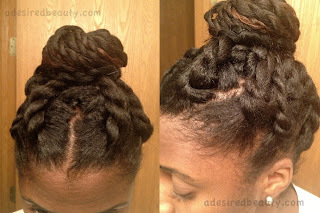 This is also a great option for ladies who may have enough hair to get up in a pony, but not enough to make a bun. I, however, didn't have any braiding hair just laying around and do have enough hair to make a bun. I wanted the effect of putting a donut on to make my bun without using my huge donut. Since I did have a little Marley hair, I wrapped that around my ponytail like a donut and then formed and pinned my bun around it. It really was that simple. Took about 40 minutes and I think that was just because I was watching tv at the same time. Super Cute! I'll have to add this style to my "To Do" List! Love it:) Looks really great.